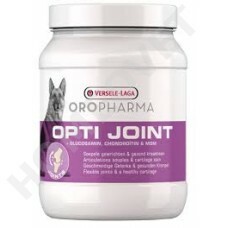 Versele Laga Oropharma Opti Joint supports the quality and smooth functioning of the joints. It is especially suitable for dogs with reduced mobility and painful joints. Opti Joint can also be used preventively. 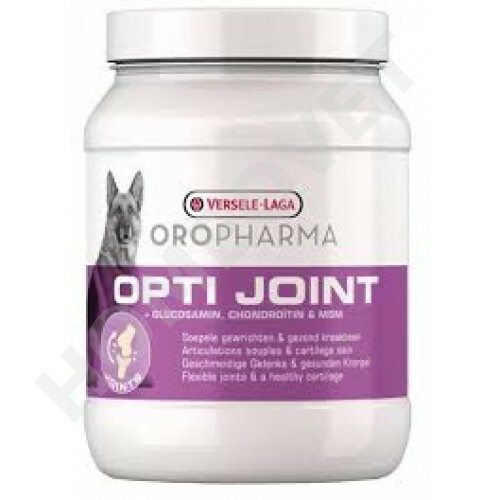 Opti Joint contains methyl sulphonyl methane (MSM), glucosamine and chondroitin sulphate for the building and repair of cartilage. Opti Joint relieves pain and therefore improves your dog’s quality of life. Opti Joint contains glucosamine, chondroitin and methylsulfonylmethane (MSM). These are the basic building blocks for building new cartilage. MSM contributes to the smoothness and elasticity of the joints. The added Vitamin C is a powerful antioxidant. In addition, the vitamin C plays a role in the production of collagen, an important component of cartilage and the ligaments of the joint. Omega 3 fatty acids from salmon oil (with a guaranteed content of EPA and DHA), Boswellia serrata (incense), Harpagophytum (devil's claw) and nettle provide a significant relief of symptoms. The brewer's yeast tastes your dog not only good but it also counteracts the aging of the joints. Daily over the food. Do not administer in the drinking water. If there is a visible improvement, the dose can be reduced by half, 700 g Opti joint is sufficient for an average dog of 30 kg for a treatment over a period of two months.